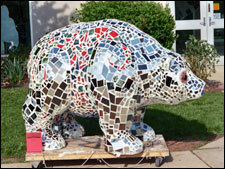 “Disco Bear,” a creation of Taylor Backes’ glassblowing studio, and sponsored by Jane and Paul Stahl, Stahl Marketing, glimmers in the afternoon sunlight. The home of Taylor Backes and TibiTu, glassblowers extraordinaire, located at Second and Washington Streets, Boyertown, is the place to go for eye candy. Entering their modest studio will take your breath away. Colors, textures, shapes will take you on visual journeys toward the skies and seas through their luster and beauty. You’ll love it. Will Dexter and Etta Boettger will always find time to talk. It always feels like home at Taylor Backes. 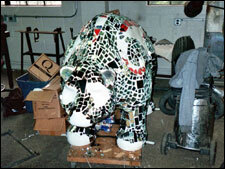 And the artists themselves welcome you to watch them create their pieces of sparkling beauty. Just step carefully into the room with the kiln where the “magic” takes place. Paul and I love glass; and so, when we had a chance to approach Will about being part of the project, he was eager to participate but wanted only to be linked to a sponsor who would let him create whatever he wanted. Paul and I knew we’d love whatever type of bear he’d create. 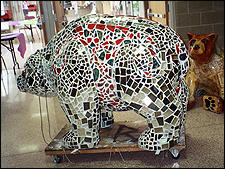 Disco Bear is unfinished; Taylor Backes’ artisans and BASH students have spent hours in time-consuming and sometimes (literally) painful work epoxying hundreds of sharp pieces of glass properly in place and must spend many hours more to complete him. But Disco Bear has already lured first-time visitors into the studio where they no doubt are as “wow-ed” as we always are when we enter. 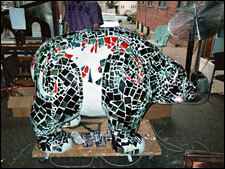 And, potential sponsors should note that Will would love to do another bear. 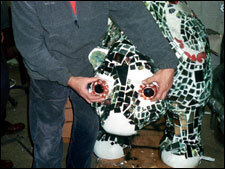 Will’s plans for Disco Bear include installing the proper plumbing so the bear will become a fountain. Imagine: sunlight reflecting from a spray of water sprinkling over a mosaic of glass. Stunning! You’ll love it too! They’re everywhere…they’re everywhere…or so it seems! Everybody knows Paul and many recognize his work all over the community in the logo marks and advertisements you see everyday. Ask his grown children, Amy or Jeff, and they’ll point out their dad’s signature style in store front signs and T shirt designs, for example. Paul’s been in business for 28 years—as Stahl Advertising Design—until 1992 when he sold his full-service advertising agency to Epps Advertising in Collegeville—and created his current consultant business known as Stahl Marketing. Paul’s a “bottom line” guy and has his own line of university sweatshirts sporting the motto developed by his associates: “PSU—Paul Stahl University—Educating the World Since 1947.” Ask for information; he’ll be happy to provide a realistic perspective of the world seasoned with his unique humor. Paul is a co-founder of the Raccoon Club, Boyertown’s largest service organization, which boasts over 200 members and almost $2000 in donations to charitable and non-profit organizations over its short history. Not a fan of recognition, Paul enjoys serving as an “Indian,” not a “chief,” but his life is all about service to the Boyertown community. He is a 30-year member of the Boyertown Optimist Club and was an invaluable member of Boyertown’s first Holiday Open House Tour. He currently donates his time and talents to Bear Fever, Boyertown’s public art project; the Holiday House Tour; the BBB’s Promotions Committee’s plan for a book about Boyertown as well as assorted Main Street events. There are only a handful of people that Paul doesn’t know. These few individuals Jane may have taught in her 35-year career as a teacher at Boyertown Junior High West or Boyertown High School. Jane’s mission is to provide her students opportunities to use their communications skills in real life activities so that her students learn about the “real world” and the community in which they live and so that the community know and love her wonderful students! Call her to discuss Bear Fever, and she’ll happily bring young people to meet you. Jane is proud not only of her students’ recent efforts in the Bear Fever project; but also their involvement in the Holiday Open House Tour; “Insight,” Boyertown High School’s cable TV talk show; and in the series of books featuring student essays about transforming moments in their lives. Retired now from teaching, Jane collaborates with Paul on assorted community projects and offers her communications skills in his marketing consultant business. Both born and raised in Boyertown, Jane and Paul are eager to beautify and promote the Boyertown community, maintain its charm and economic health, build community spirit, and have fun too through their assorted activities.